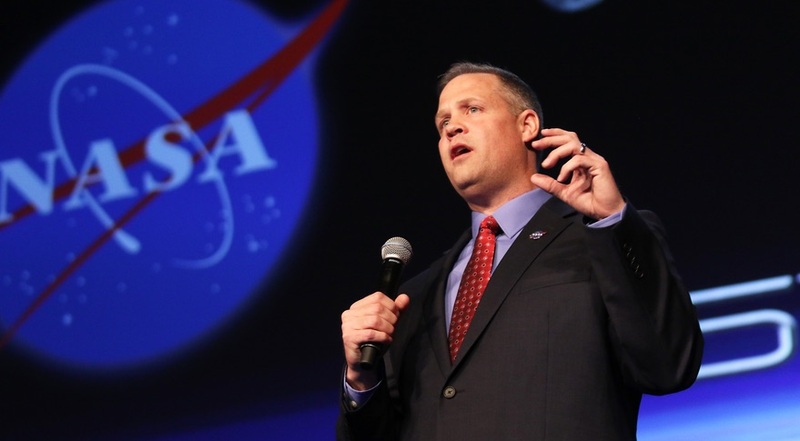 COLORADO SPRINGS — NASA Administrator Jim Bridenstine said the agency’s approach to moving up a human lunar landing from 2028 to 2024 will focus first on speed and then on sustainability. In a plenary speech at the 35th Space Symposium here April 9, Bridenstine said the new approach the agency is developing in response to the goal of a human lunar landing in five years announced by Vice President Mike Pence two weeks ago will involve many of the same elements of NASA’s original plans, but in a revised order. “All of those elements that were necessary to getting humans to the surface of the moon in 2028, all those elements still exist. The plan is still the same,” he said. That includes, he said, development of the Space Launch System and Orion spacecraft, a lunar Gateway in orbit around the moon, and lunar landers. That phase will also include the lunar Gateway, although Bridenstine suggested it would initially incorporate only a fraction of the elements previously proposed for it by NASA and international partners. “The first elements of Gateway are focused exclusively on the surface of the moon,” he said, specifically mentioning the Power and Propulsion Element NASA is currently reviewing proposals for, as well as a habitation module. NASA is also changing its approach for developing lunar lander elements. NASA issued a solicitation in February as part of its Next Space Technologies for Exploration Partnerships (NextSTEP) program, seeking concepts for a transfer vehicle and a descent module. At the time agency officials said they planned to keep studies for the lander’s ascent module, which would require human rating, within the agency. However, on April 8 NASA announced it would soon issue another NextSTEP solicitation for ascent module concepts. That solicitation, which will likely start with study contracts but could soon lead to technology development awards, is designed “to enable rapid development and flight demonstrations of human lunar landers,” the agency said its procurement filing. NASA rushed through that new ascent module solicitation in just seven days, Bridenstine said. “We could have had it out in four days, but I put the brakes on it because I wanted to make sure we were heading in the right direction,” he said. All three elements of the lunar landing system, he said, will be developed as public private partnerships. The Commercial Lunar Payload Services (CLPS) program, where NASA awarded contracts to nine companies developing commercial lunar landers that can carry agency payloads, will also factor into this phase. “We’re focusing those capabilities on projects and science that can help us get humans to the surface of the moon, to the most valuable places on the surface of the moon, as soon as possible,” he said. A second phase of the lunar return effort would kick in after achieving that first human landing, he said, and would focus on long-term sustainability of the exploration architecture by 2028. He gave few details about that approach, but noted it would involve building out the Gateway and making sure key elements like the lunar landers are reusable. Bridenstine said little about the cost of this new approach, but confirmed earlier statements that the agency will provide an amended budget proposal to Congress in the near future. He hinted that NASA might ask international partners to contribute more or seek additional partners.